A few months ago, I shared a recipe for coconut ice cream that my family liked but didn't love. After that, I kept looking for a recipe that didn't call for canned cream of coconut (which contains gums and stabilizers). Earlier this month, I found a recipe that we really enjoy! I copied it into my planner (my BusyBodyBook saves the day, again!) but failed to note the website where I'd found it. This morning I finally found it again, so I can give proper credit to The Jalapeno Cafe for this wonderful recipe. In a medium size saucepan over medium-low heat [I did this in the microwave], warm the cream with the sugar and vanilla. When hot, but not boiling, remove from heat and let cool slightly. Add the half-and-half and the coconut, stirring well. Cover and place mixture in refrigerator to chill. Place in tub of electric ice cream maker. If not full, add 1/2 cup of cold milk and follow the ice cream maker's instructions. The ice cream should make in about 20 minutes. To Toast Coconut: Place coconut on shallow baking pan and bake in 325 degree oven, 12 to 15 minutes, stirring often to prevent burning. 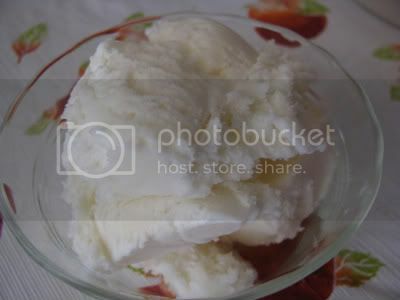 The photo I'm including is from the first coconut ice cream recipe we tried, but they look almost identical. I didn't get any pictures of the new batch before it was gone. It was that good. I'm linking up to the Mystery Ingredient Challenge: Coconut Edition at Our Krazy Kitchen and Works For Me Wednesday at We Are THAT Family. Disclosure: Although I have reviewed the BusyBodyBook, I have not received any compensation for mentioning it here. I love coconut! Maybe I can get my husband to try this too--he not as much a fan. I am always interested in finding new ice cream recipes for my little maker. Wow, makes me want an ice cream maker! Stopping by from Krazy Kitchen. This ice cream looks fabulous! I just bought an ice cream maker a couple days ago and have already made two batches of frozen yogurt. I am seeing that this could be very dangerous! I will have to try this recipe though. My whole family loves coconut! Thanks! I'm going to give this recipe a try - thanks for sharing it! My parents, sibling and I all LOVE coconut!! Definitely giving this a try! !